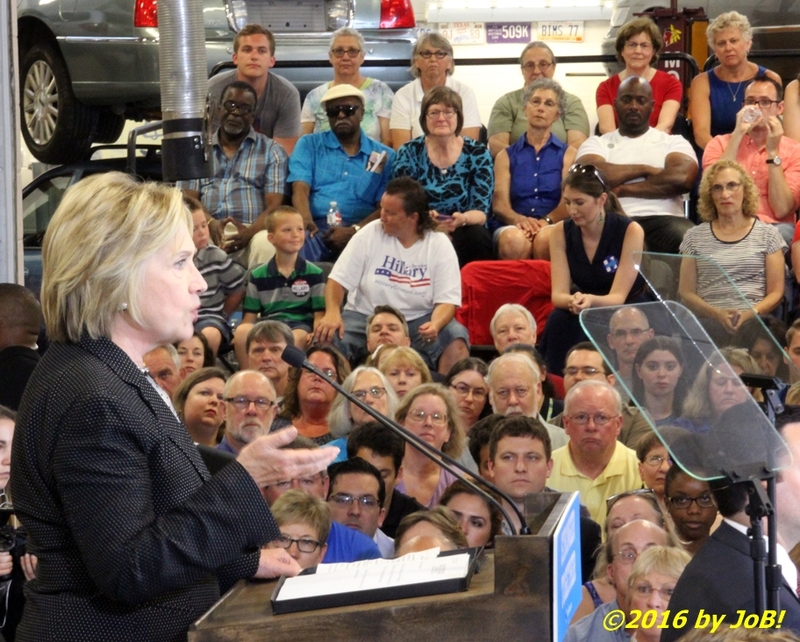 Supporters listen to presumptive Democratic presidential nominee Hillary Clinton's economic speech inside an automotive technology bay at the Fort Hayes Metropolitan Education Center in Columbus, Ohio on Tuesday. This city-wide alternative magnet school was selected to host the event due to its multi-track curricula for preparing students for professional and technical careers in the workforce. That latter role was evident to those in attendance due to the speech being presented inside one the facility's automobile technology bays. 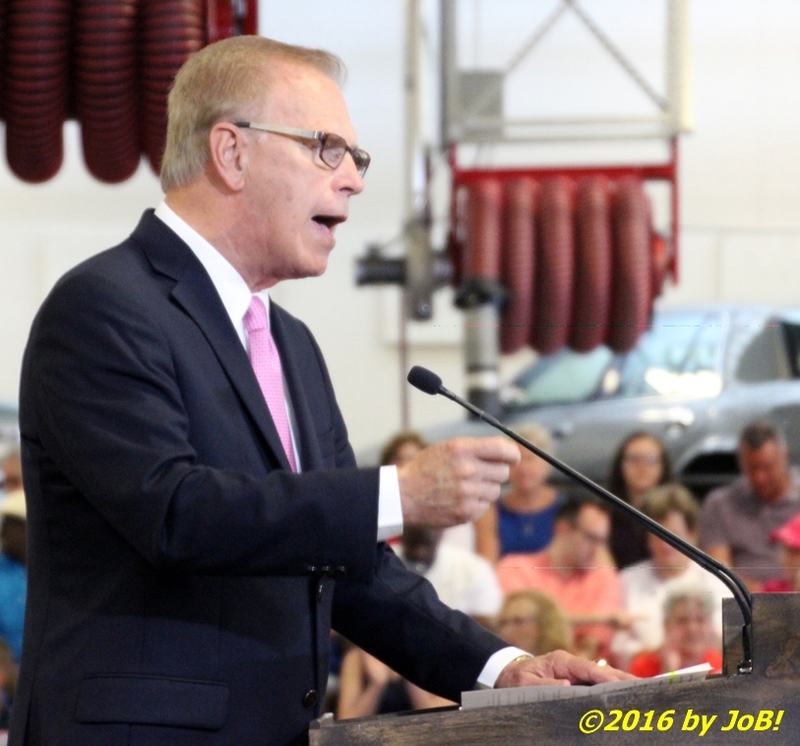 Former Ohio governor (and current Democratic US Senate candidate) Ted Strickland addresses the crowd at Columbus' Fort Hayes Metropolitan Education Center prior to Hillary Clinton's economic speech. 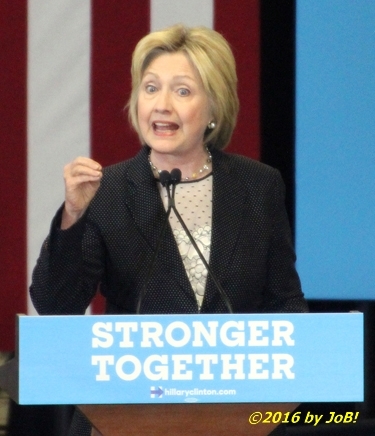 At the beginning of her 45-minute speech, Secretary Clinton reminded the audience about the dire condition of the US economy when President Obama took office in January 2009 and how his policies helped those across the country and in Ohio recover from that financial crisis. As for her strategy for continuing that progress, she said "America’s economy isn’t yet where we want it to be, but we are stronger and better positioned than anyone in the world to build the future that you and your children deserve." Clinton said that her speech the next day in North Carolina would roll out goals for building a "stronger, fairer economy" but she used the remainder of her time on that day to remind the American people what the Republican presumptive nominee has already promised to do with our economy if he is elected by bringing up statements given during his party's primary debates and while out on the campaign trail. 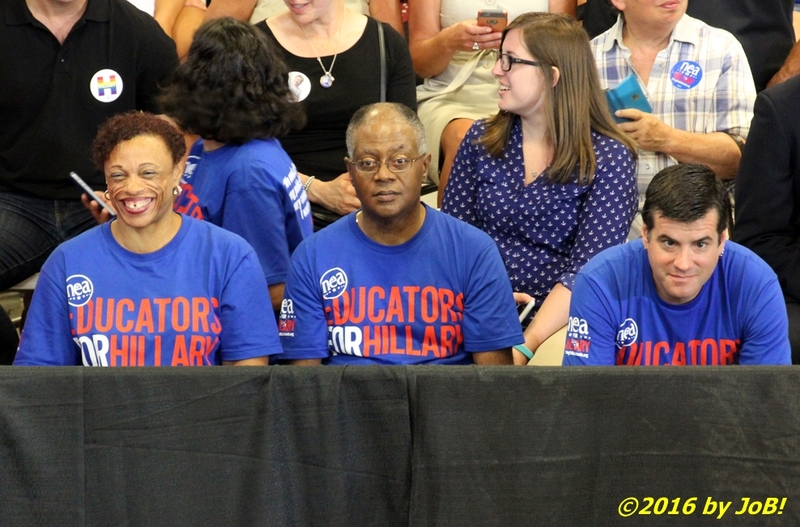 Local educational representatives await the start of Hillary Clinton's economic speech at the Fort Hayes Metropolitan Education Center in Columbus, Ohio on Tuesday. Much like the rebuke she gave in San Diego, California earlier this month that highlighted Trump's lack of foreign policy experience, Clinton quoted her opponent 's own words in a point-by-point analysis of how the Republican's positions on banking regulation, the national debt, tax rates for corporations and the rich, immigration and trade policies would jeopardize both the US and global economies. She then pivoted to his well-known personal financial issues in the entertainment industry. "He’s written a lot of books about business. They all seem to end at Chapter 11," was a swipe at Trump's multiple bankruptcy filings for failed business ventures over the past 25 years. 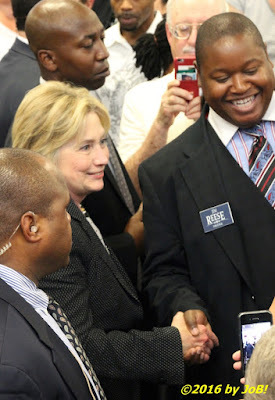 Presumptive Democratic presidential nominee Hillary Clinton poses for a photo with Franklin County Court of Common Pleas judicial candidate Jim Reese at the conclusion of her economic speech in Columbus, Ohio on Tuesday. With recent statewide polling showing Clinton and Trump in a statistical tie, her campaign has made Ohio one of several "battleground" states in which to focus personal appearances by the candidate and her surrogates as well as media ad buys in an early attempt to paint Trump as unfit for the presidency prior to the party conventions and the official start of the general election season. Clinton's initial appearance after securing the nomination from Vermont senator Bernie Sanders was a kickoff event held in Cleveland that was muted by the Orlando nightclub shooting that happened the day before. It was recently announced that Massachusetts senator Elizabeth Warren will make a joint appearance with Clinton in Cincinnati next Monday. 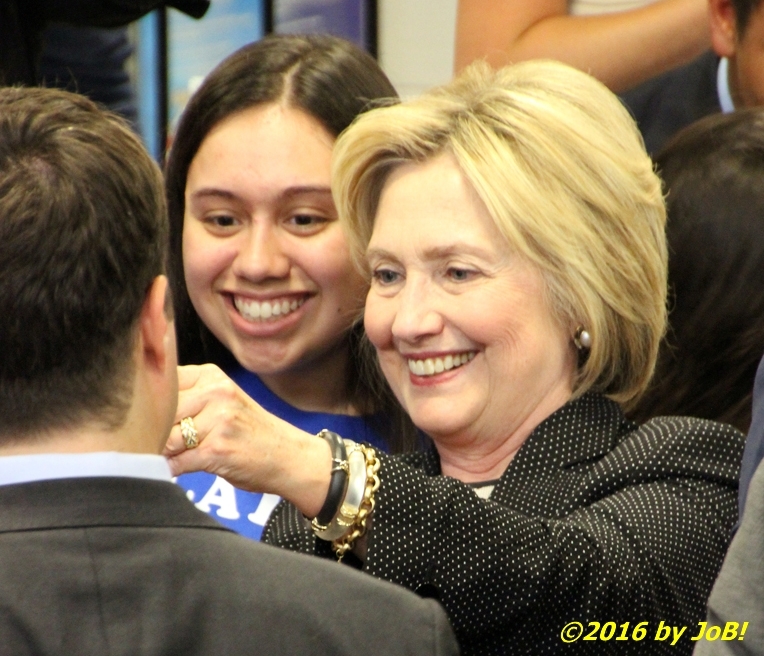 Presumptive Democratic presidential nominee Hillary Clinton poses with a supporter for a cellphone photo at the conclusion of her economic speech on Tuesday at Columbus, Ohio's Fort Hayes Metropolitan Educational Center.